Results: Researchers at Pacific Northwest National Laboratory and the University of Texas at Austin discovered that a single hydrogen atom just can't keep still after it splits from a water molecule on the surface of the catalyst rutile titanium oxide. The hydrogen atom hopscotches across the oxygen atoms that stud the surface of the catalyst, while the hydrogen on what is left from water remains fixed suggesting that the electronic structure of this popular catalyst is not entirely as it seems. Why it matters: By understanding how water's atoms behave on this catalyst's surface, scientists and engineers may be able to develop more efficient solar cells, corrosion-resistant materials, and technologies that split water to generate hydrogen gas, a possible alternative fuel for everything from heating homes to powering automobiles. 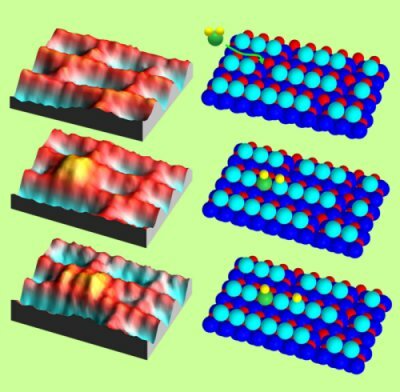 Methods: Using a scanning tunneling microscope, the researchers examined the atoms on the catalyst's surface before and after water adsorption. The surface's topographical map looks like a washboard on a dirt road with ridges and valleys repeating indefinitely. Here the ridges are rows of oxygen atoms and the valleys are rows of titaniums. When one of the oxygens is removed it exposes the underlying titanium and creates the reactive pocket on the catalyst. When water - H2O - reaches the surface, at room temperature, the water molecule discards one of its two hydrogen atoms. What remains of the water molecule, an oxygen bonded to a hydrogen, settles into one of the reactive pockets, and the discarded hydrogen binds to the nearest oxygen. Then, the discarded hydrogen begins to hop down the row of oxygen atoms. This hydrogen is roughly 10 times more likely to move than the other hydrogen from the same water molecule. This research points to an underlying difference in the atomic structure near the catalyst's active sites. What's next: The researchers plan to study the titanium oxide material at higher temperatures to see how fast the hydrogen atoms move. They are also working on developing a detailed understanding of the underlying mechanisms and intermediate species. Funding agencies: The U.S. Department of Energy's Office of Basic Energy Sciences, Chemical Sciences and Materials Sciences Division, Robert A Welch Foundation and the National Science Foundation funded this research. The research described in this highlight was performed in the Environmental Molecular Sciences Laboratory, a national scientific user facility sponsored by the Department of Energy's Office of Biological and Environmental Research and located at Pacific Northwest National Laboratory. Citation: Zhang, Z, O Bondarchuk, BD Kay, JM White, and Z Dohnalek. 2006. "Imaging Water Dissociation on TiO2(110): Evidence for Inequivalent Geminate OH Groups." The Journal of Physical Chemistry, Part B, 110:21840-21845.